But, when i opened this file on my mac, everything ok with it. Thats why i started from the very beginning and try to install AnimServo soft on my main computer. Here is the path where i put AnimServo files and after that i launch it in Maya 2018. I see you posted some homework with moving serovs. Are you still having issues? If so I can pass things along to the instructor. 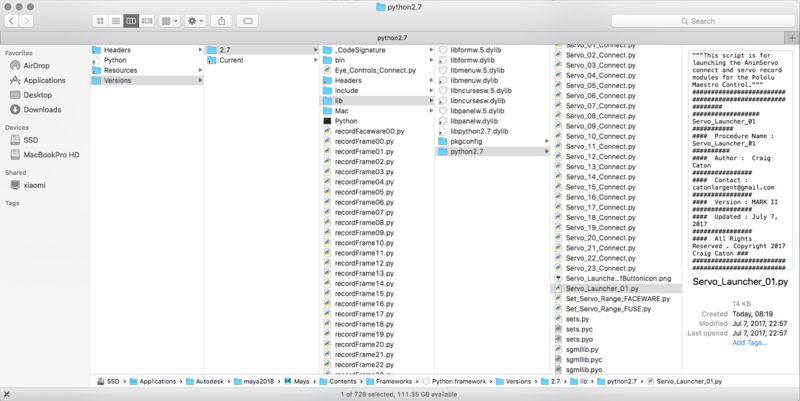 I can't tell from your screen shot, but it looks like the file called "Eye_Controls_Connect.py" is not in the correct folder. Maya is looking for the file and cannot find it in it's Python folder. Thanks, @Craig Caton-Largent , for your reply. Now on my mac everything work correct. When i will have some more free time i will back to studying your third lesson.